One of North America’s gifts to the world is maple syrup. The earliest history of the process of boiling down maple sap to extract sugar is unknown but early European explorers and settlers observed native Americans do so and soon emulated them. By the early 18th century the conversion of sap to rock maple sugar was common in Canada and the northern states. In the early 19th century production had become so widespread that Quakers and abolitionists urged the use of maple sugar as an alternative to plantation sugar cane produced by slave labor. The initiative was supported by Thomas Jefferson who planted maples at Monticello in an effort to produce his own sugar (he was not successful). The 20th century produced the invention of flexible tubing and vacuum pumping as well as enhanced methods to extract water from the sap which realized greater efficiencies and increased production. 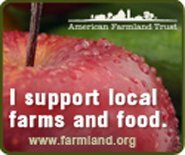 The process remains, however, relatively straightforward and today most maple syrup is produced by small, family-run businesses. 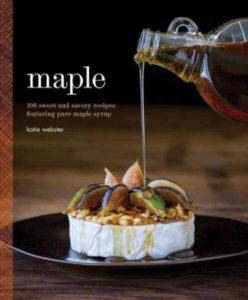 Which brings us to Maple, 100 Sweet and Savory Recipes Featuring Pure Maple Syrup by Katie Webster (Quirk Books, Philadelphia, PA, 2015). As pointed out in the book’s foreward by Molly Stevens, food writer and cookbook author, what could be better than a sweetener that comes directly from the woods, is naturally sustainable and contains nothing but fresh sap boiled down to a delicious syrup? If more persuasion is needed, Katie Webster points out that maple syrup is not stripped of its micronutrients during production (unlike refined sugars). For those concerned about sugar intake, the good news is also that less maple sugar than white sugar is required to sweeten a recipe, a point reinforced throughout the book. Maple abounds with not only breakfast recipes, as one might expect, but also a wide range of maple-flavored recipes for appetizers, soups, salads and main courses. The latter include dishes such as maple/ginger chicken thighs, maple pork loin roast and sweet and sour cabbage rolls. Who knew there was so much more to pure maple syrup than serving as a delicious accompaniment to pancakes or glazing for yams? Not surprisingly there are several cookie and dessert recipes – and even a couple for drinks such as maple peach old fashioned and the charmingly-named mapletini – which comes nowhere near a classic martini but, if Katie Webster is to be believed, should make no apologies for that. Each recipe is clearly and simply set out with Katie Webster’s own superb food photography illustrating the recipes. Webster’s photos are complemented by Kristy Dooley’s natural light, on location photographs of the late winter tapping of maples in the still snowy state of Vermont, well-known for its maple sugaring tradition. Every recipe includes a friendly hint or advice from the author. An example, a recipe for a classic French dessert, clafoutis, counsels against panic when it threatens to puff out of its pan while baking: it won’t but will fall back into place as it cools. That’s the sort of reassurance that will alleviate the worry of many unfamiliar with the exuberant behavior of clafoutis in the oven. Although this is not a book that tilts towards science, there is an informative chapter on the chemistry of maple sugar, which is useful to develop an appreciation of how it reacts differently from refined sugar. It also contains a handy guide to the different grades of syrup as well as helpful pantry notes and a list of resources. There is also an index that employs the symbols G, V and P to identify specific recipes for the guidance of those on gluten-free, vegan or paleo-friendly diets. For the very adventurous, there are even hints on backyard production, including a reminder that it takes about 40 gallons of sap to make a gallon of syrup: it is thus not an operation for the faint-hearted. Finally, a comprehensive conversion table of US measures to metric (volumes, weights and oven temperatures) would make the book an ideal gift from America to overseas. Maple provides a straightforward overview of maple sugar in its various forms and uses, delivered in a very attractive package. Not to mention that it makes for an exquisitely mouthwatering read!